Real Food Reviews: Park Bench Deli - Pretty Good Grilled Sandwiches! 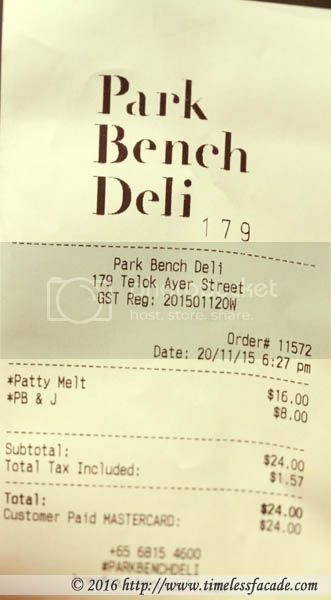 Park Bench Deli - Pretty Good Grilled Sandwiches! After my disappointing sandwich at Melt Bar, I had all but given up hopes of finding something similar to that of Toastface Grillah in Perth. But as luck would have it, I chanced upon Park Bench Deli one weekday evening. 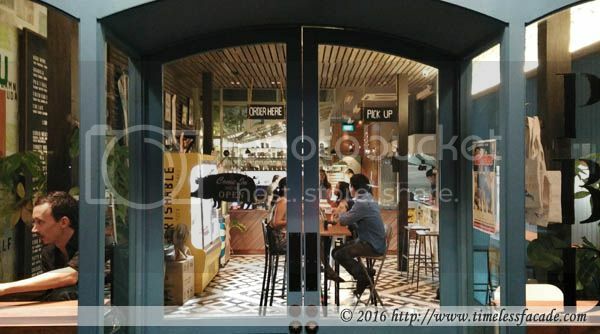 Occupying a small shop along Telok Ayer Street, Park Bench Deli's industrial themed interior gives off a hip vibe, with the day's offerings pasted on a huge board on the wall. 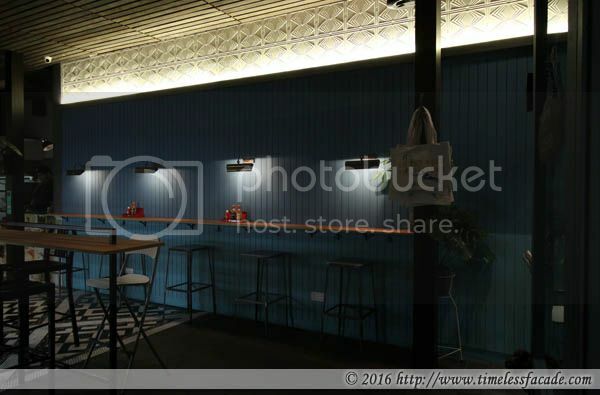 Seating is rather limited and you have to order and make payment at the counter. 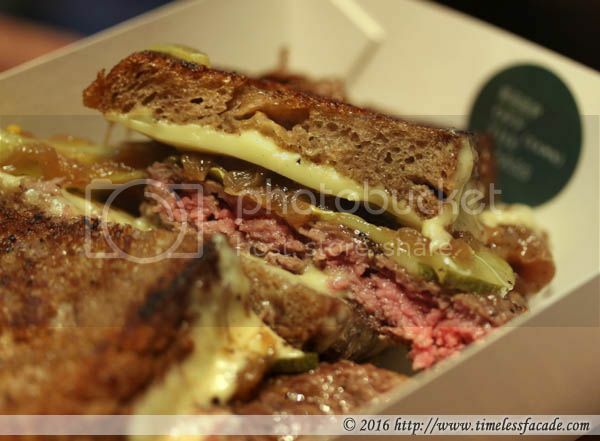 Pink in the middle and a perfect medium rare, the beef patty came across as tender and well seasoned (a tad overly salty though), topped with gooey melted American cheese and sweet grilled onions, all layered between two slices of crackling crisp rye bread. Pretty delicious but Toastface Grillah's sandwiches still take the cake. PBD's take on the classic PB & J was pretty interesting. 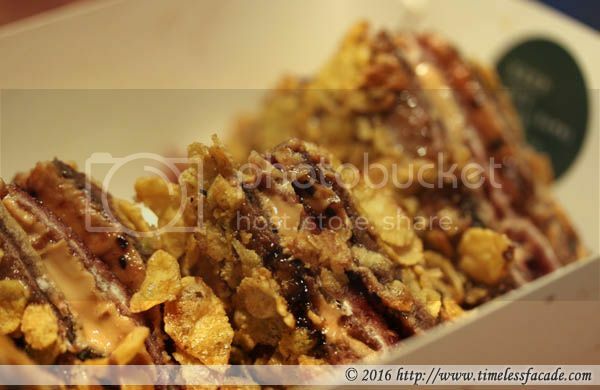 Crusted with cornflakes for that extra crunch, the first thing that hits you is the peanut butter, with the sweetness of the jelly helping to cut through the smooth richness. However I would have appreciated a little more peanut butter and jelly for a more robust flavour. It was also a little annoying to have the cornflakes stick to my teeth at times. Not as good as the one from Artistry in my humble opinion but good enough! My stomach threatened to explode after consuming both sandwiches but it was worth it, especially since the food was reasonably priced at $24 nett. I'll definitely be back to try their grilled cheese and cheese steak sandwich!